It has been two days since the march began, and Coxey’s Army of the unemployed is still in Stark County, Ohio. The army has picked up some new members, but they have also lost quite a few. And Jacob Coxey is gone; he’s headed to Chicago. Meanwhile, some deserters have already made it as far west as Richmond, Indiana. And politicians are starting to comment on the march. ALLIANCE, Ohio, March 27. — The Coxey army reached Alliance at 12:50 today, hungry, cold, tired, but enthusiastic. It is spending the night here in Camp Bunker Hill. It came here from Louisville, fourteen miles away, where the privates slept last night in the Town Hall, Coxey and his aides comfortably lodging in a hotel. Camp was struck at 9:15 o’clock, after a breakfast of eggs, fresh meat, potatoes, bread, and coffee. Louis Smith, the “Great Unknown,” was in command during the march hither. Ninety-eight men were in the ranks – an increase over yesterday of nineteen men. The new recruits are better appearing men than the original Coxeyites. At the corner of Main and Lesh Streets the command halted and gave three cheers for Mayor Shay. This was in return for the use of the Town Hall for a dormitory. A troop of Alliance horsemen fell into line as the army entered this city. It was heartily cheered. The supplies exceed requirements, and Coxey says a shipment will be made to some points east if the donations continue to roll in. 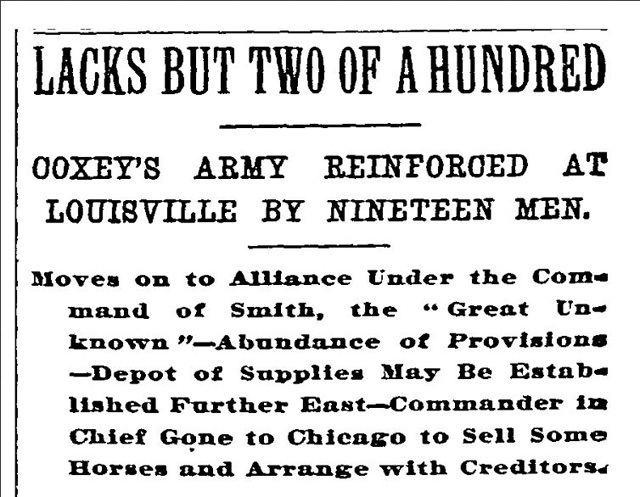 Coxey left this evening for Chicago to sell two horses and to come to some understanding with his creditors. He anticipates no difficulty in arranging his affairs. He made a brief statement about his financial troubles. He says the suit brought in Pittsburg relates to a disputed bill. Coxey expects to rejoin his army Thursday at Salem. Read the full article from the New York Times archives.